If you have ever wandered up and down the cold and flu aisle at your local pharmacy or grocery store wondering what medication to take, this article is for you. There are hundreds of medications to choose from and way too many people just grab things and start taking them not knowing which ingredients could be interacting with each other. To help make it a little simpler, we are compiling a list of some of the most common cold and flu medications (available in the US). We will talk about which can be combined and which shouldn't. If you don't see the medications you want to take on the list, we'll help you figure out what you can do with those too. This is not a complete list. But we have to start somewhere. Tylenol (acetaminophen) - pain reliever/fever reducer, active ingredient: acetaminophen. Should not be combined with other pain relievers/fever reducers unless specifically instructed by a health care provider. Alternating with ibuprofen is okay as long as you are not giving more acetaminophen than is recommended in a 24 hour period or with each dose. Many multi-symptom medications also contain acetaminophen and should not be taken with Tylenol or generic versions of Tylenol. To name just a few: Vicks Dayquil Daytime Cold and Flu, Theraflu Flu Cold and Cough, NyQuil, Coricidin HBP Cold&Flu, Alka-Seltzer Plus Cold. Always read the ingredient label on the medications you are taking - do not take more than one medication that contains the active ingredient acetaminophen. Motrin/Advil (ibuprofen) - pain reliever/fever reducer, active ingredient: ibuprofen. Should not be combined with other pain relievers/fever reducers unless specifically instructed by a health care provider. Alternating with acetaminophen is okay as long as you are not giving more than is recommended of each medication in a 24 hour period or with each dose. There are not as many multi-symptom medications that contain ibuprofen but you should always check the labels anyway. Some multi-symptom medications that may contain ibuprofen include Advil PM, Duexis, Ibudone, and Vicoprofen. Do not take aspirin when you are also taking other products that contain aspirin such as Alka-Seltzer, BC Powder, Excedrin, Goody's, Lortab and Vanquish. Pepto-Bismol also contains a derivative of aspirin and should be used with caution if you are taking aspirin. Aleve (naproxen) - pain reliever, active ingredient: naproxen sodium. Should not be combined with other pain relievers unless specifically directed by your doctor. There are not many multi-symptom medications that contain naproxen, but you should use caution and consult your health care provider if you are taking multi-symptom medications that contain any type of pain reliever/fever reducer - especially if it is another NSAID such as ibuprofen or aspirin. Products that contain naproxen in addition to other ingredients are Aleve PM, Treximet, and Vimovo. Robitussin Long-Acting Cough - cough suppressant, active ingredient: dextromethorphan. The active ingredient in Robitussin is dextromethorphan - a cough suppressant. How well this medication works is debatable but it should not be combined with other medications that contain a cough suppressant. 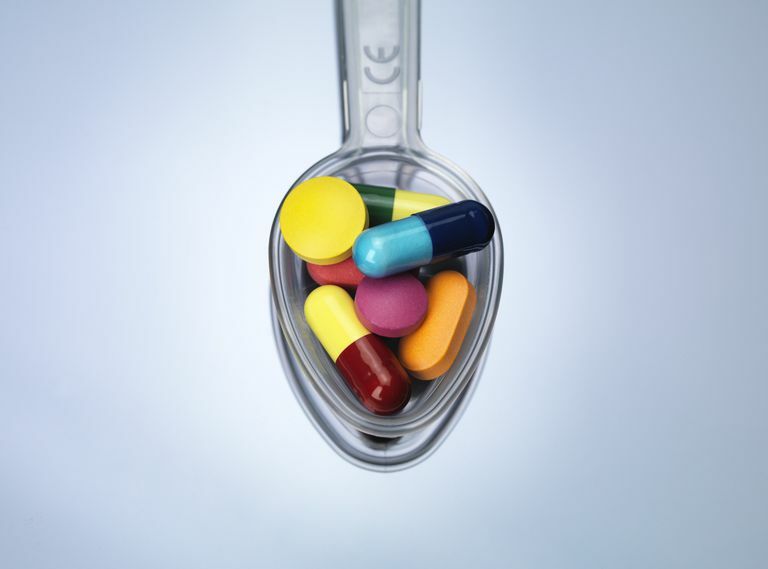 Other medications that contain dextromethorphan include Alka-Seltzer Plus Cold and Cough Formula, Children's Dimetapp Cold and Cough, Vicks Dayquil Cough, Mucinex DM, Pediacare Children's Cough and Congestion, Robitussin Cough and Cold CF, Sudafed PE Cold/Cough, Theraflu Cold and Cough, Triaminic Cold and Cough, Tylenol Cold and Cough, Vicks NyQuil Cough and many, many others. Always read the label of every medication you take. Mucinex - expectorant, active ingredient: guaifenesin. Read labels carefully when taking guaifenesin and any other cold and cough medications. Many multi-symptom cold and cough remedies contain guaifenesin - the active ingredient in Mucinex. Some common medications that contain guaifenesin include Tussin, Equate Tussin DM, Robitussin Cough, and Chest Congestion, Vicks Dayquil and Zicam. There are many others. Read labels carefully and do not take more than one product containing guaifenesin. Sudafed - decongestant, active ingredient: phenylephrine or pseudoephedrine. Should not be combined with other medications containing decongestants such as NyQuil, Tylenol Cold Multi-Symptom, Alka-Seltzer Plus, Robitussin Multi-Symptom. Many others as well. Always look at the active ingredients - do not combine with other medications containing phenylephrine, pseudoephedrine or decongestants. Benadryl - antihistamine, active ingredient: diphenhydramine. Should not be combined with other antihistamines unless specifically instructed to do so by your doctor. Also, should not be combined with topical Benadryl cream. Other antihistamines and medications containing antihistamines include Claritin (loratadine), Zyrtec (cetirizine), Allegra (fexofenadine), Advil PM - and any other "PM" medication, PediaCare Children's Allergy and Cold, Sudafed PE. Always look at the active ingredients and do not combine with other medications that contain diphenhydramine or other antihistamines. **In some cases, your health care provider may recommend taking multiple antihistamines to treat significant allergic reactions. Only do this when specifically instructed by your doctor. There are far too many multi-symptom cold and cough medications to list. Most of them should not be combined with each other. If you need to take more than one medication at a time, always check the labels and be sure you aren't taking multiple medications with the same or similar active ingredients. If you are taking single symptom medications, in general, it is okay to take several medications as long as they do different things. For example - taking a decongestant, expectorant, and pain reliever would be okay but taking two decongestants would not. If you aren't sure what to take, talk to your pharmacist or health care provider. If you have chronic medical conditions or you are taking other medications, talk to your pharmacist to be sure there are no interactions or adverse reactions that you need to know about.